Welcome to the five hundred and forty-sixth of my blog interviews with novelists, poets, short story authors, biographers, agents, publishers and more. Today’s is with biographer Gearoid O’Dowd. A list of interviewees (blogged and scheduled) can be found here. If you like what you read, please do go and investigate further. Morgen: Hello, Gearoid. Please tell us something about yourself, where you’re based, and how you came to be a writer. Gearoid: Hello Morgen. I live in Galway, Ireland and have come to writing rather late in life (58). Although I have worked as a musician for most of my life, I have loved books since I was very young. I remember looking forward to the weekly trip to the local library with great excitement when I was a lad. Morgen: Oh, me too. I’d max out my card. 🙂 You write non-fiction, how do you decide what to write about? Gearoid: I was actually in the process of writing a novel when I found my Uncle Chris’s war record. After learning some more about his exploits, I realised I already had a great story to tell – and one you couldn’t make up! The novel was quickly ditched…I may return to it – but to be honest: in today’s economic climate, I think I would have had difficulty in getting a publishing deal. Morgen: Mark Twain came out with some great quotes and probably the most famous is “Truth is stranger than fiction, but it is because Fiction is obliged to stick to possibilities; Truth isn’t”, and it’s so true. One of my free eShorts (Feeding the Father) is based on a true story and I’m sure some people think it’s unbelievable (I still have the article to prove it :)). What have you had published to-date? Gearoid: ‘He Who Dared and Died’ is my first book. Morgen: How exciting. Are your book available as an eBook? Do you read eBooks or is it paper all the way? Morgen: It’s how most people are buying their books these days which, despite having the Kindle application on my iPad, is a shame because there is nothing like the real thing, but then I hate creasing spines so have no problem with that on the iPad. Did you have any say in the titles / covers of your books? How important do you think they are? Gearoid: Not as much as I would have liked. My original choice for the title was; ‘One Who Dared; The Adventures of an Irish SAS Man’. At this stage I had interest also from an Irish publisher. Both publishers were trying to come to a compromise regarding title, cover etc. – but they couldn’t work out their differences. I think my choice of title would have projected the paradox of the story (Irish-SAS) better, but in the end I left them to it. I had more input in the cover design; at least my opinion was sought and I was happy with the result, I must say. I think both are important, and I suppose I would have been more stubborn with the title of a novel, if that had been the case. Morgen: I guess you have to hope that the publishers know what they’re doing. What are you working on at the moment / next? Gearoid: Something similar actually – I’m exploring Galway’s connections with British Fascist leaders during and after WW2. (Lord Haw-Haw lived in Galway as a boy and Sir Oswald Mosley also retreated to live there for eleven years, following the war’s end). Morgen: It’s clearly your passion. Do you manage to write every day? Do you ever suffer from writer’s block? Gearoid: I sometimes take a break for maybe two days at the most. But if I’m working on a definite project, I tend to stay close to the job at hand. The work is always in my head, regardless of what I’m doing around the house, so I will often nip back to the pc, while in the middle of something else, and tap out a few sentences. In the end, I think every writer finds their own method of working and what suits one person would hinder another. Morgen: I have a Mac and it’s advised to leave it running (apparently with any electrical item, it’s the powering up / down that does the most damage) so it’s all too-tempting to sneak into my study when I’m away from it, but then I’m usually tied to it so the break is good!). Do you do a lot of editing or do you find that as time goes on your writing is more fully-formed? Gearoid: You can never do enough editing really. It may be tedious, but it is pivotal to good writing. There is often an easier and better way to get your point across. Morgen: It is. With my debut novel (my third-written), I knew that the first draft was just the beginning. Over the next three years (to the month), I did seven edits and I hope it’s the better for it. Do you have to do much research? Gearoid: Yes, your research is the foundation of your work. It can often be the most exiting part of the project and can be filled with ‘Eureka’ moments. It can also be dull and frustrating. Morgen: I used to say it was one of my least favourite aspects but at least we have the internet… we just have to be careful that we don’t get too side-tracked. Do you have pieces of work that you think will never see light of day? Gearoid: O yes! – The afore-mentioned novel for starters. Morgen: Oh dear. But maybe when you go back to it, you’ll either realise it’s not as bad as you thought or having written two (or more?) books since then you’ll know what you’re doing ‘wrong’. Do you pitch for submissions and / or are you commissioned to write? Gearoid: I think you need to be very well established to get a commission. For me, I had the endless and often thankless job of sending off my three paragraphs, synopsis etc. It was only after I had two concrete offers of a contract that I decided to get an agent. Morgen: Ah, so you have an agent. Do you think they’re vital to an author’s success? Gearoid: Yes, I’m with the Prizeman / Kinsella Agency. I wouldn’t say an agent was essential though. The writer gets little enough reward for their work, and an agent’s percentage eats a little more away. If you are one of those people whose eyes glaze over at the sight of a legal contract however (like me), they can be handy! It can also be a comfort to know you have someone on your side who knows what can often be a ruthless business well. Morgen: I was offered a couple of contracts for the chick-lit novel I’ve put online and whilst it was thrilling to have that validation, and I’m still in touch with both publishers, the offers at the time just weren’t right for me. Although I felt that myself, I had guidance from a brilliant lawyer at The Society of Authors whose suggestions included self-publishing which I’ve now done. Have you had any rejections? If so, how do you deal with them? Gearoid: I’ve had loads. I always recycle them responsibly! Seriously – you can’t let them get to you. Some letters offer advice on how to proceed and so on …so it’s important to read them all. Morgen: Absolutely. If they’ve taken the time (which they don’t really have) to give you feedback, it means they see promise in you. Do you enter any non-fiction competitions? Gearoid: No – I must say I don’t know of any whatsoever. What a good idea! Morgen: 🙂 I have a few listed on my competitions page. How much of the marketing do you do for your published works or indeed for yourself as a ‘brand’? Gearoid: I do a lot of the marketing. Most of the big publishers tend to avoid any unnecessary marketing expenses and have a very tight budget. Basically the attitude seems to be; ‘Well it’s your book, so you have to push it’. This despite the fact they get the biggest slice of the cake when it comes to profit breakdown! Morgen: Sad but true. I’ve only had one author say that her publisher does her marketing yet she’s very active on Twitter and Facebook. What’s your favourite / least favourite aspect of your writing life? Has anything surprised you? Gearoid: Dealing with publishers can be a trying experience! As soon as you sign the deal, the book is no longer any of your business, it seems. That, for me, was the most surprising thing; the lack of any decent communication / feedback from the publishers and a general lack of respect for you, as the author. Morgen: Oh dear, that’s not good. I do think we have more say these days and I have interviewed quite a number of authors who are happy with their publishers, although whichever way we go, we’re cogs in a very large machine. 🙂 What advice would you give aspiring writers? Gearoid: Be prepared for rejection – it really is a hard business and you need a tough skin! Morgen: You do but then you have the right attitude; just find the right thing for the right person. If you could invite three people from any era to dinner, who would you choose and what would you cook (or hide the takeaway containers)? Gearoid: Nat King Cole, Rosa Parks and John Healy (The Grass Arena). A sumptuous Cajun feast would magically appear. Morgen: Oh yum. I love Cajun, although it’s fairly sparse here in middle England. And Nat King Cole was my dad’s favourite so I’d like to have met Nat. Is there a word, phrase or quote you like? Gearoid: ‘Who Writes Fights’ works for me. Gearoid: Reading, music and gardening are my main pastimes. I love animals / nature, especially dogs. Morgen: I don’t follow football but sounds like I should be saying a “yay” here? 🙂 And my dog will be pleased to hear of your love for them. Are you on any forums or networking sites? If so, how valuable do you find them? Gearoid: I use Linkedin mostly. I find the various writers’ forums useful. Morgen: And that’s probably how we met. Back in February I was running low on interviewees so I put a shout-out on the LinkedIn groups and was then flooded (the Published Authors Network in particular) to the point where I’m now booking into next July so I’ve pulled the request and things have quietened down. Great to know there’s that support though. 🙂 What do you think the future holds for a writer? Gearoid: That’s a tough one! I don’t suppose it will get any easier. Morgen: I think you’re right but it’s an exciting time, I think (I’m excited anyway). 🙂 Where can we find out about you and your writing? Gearoid: You can check out http://odowd.weebly.com. Morgen: Thank you very much, Gearoid. Great to have you join me today. 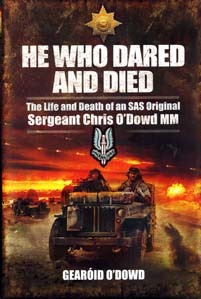 He Who Dared and Died is the action-packed account of a young Irish hero who selflessly risked and gave his life serving with elite Special Forces in the Second World War. Brought up in poverty in the West of Ireland, Chris O’Dowd ran away to join the Irish Guards aged 18. In no time he tasted bitter action in Norway but, hungry for more, he volunteered for the newly formed Commandos. After intensive training he sailed for Egypt, serving with Churchill’s son Randolph, novelist Evelyn Waugh, George Jellicoe and, most significantly, David Stirling. 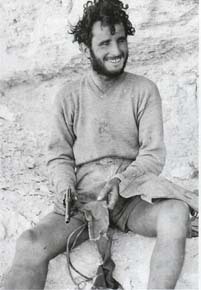 When Stirling got the go-ahead to form the SAS, his handpicked team included the young Chris O’Dowd. 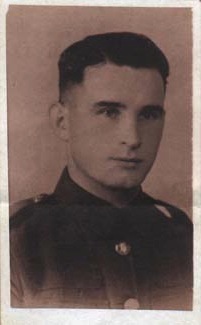 After his outstanding performance on the early SAS behind-the lines raids on enemy airfields, O’Dowd was awarded the Military Medal and promoted to Lance-Sergeant. When Colonel David Stirling was captured, the SAS’s future was in danger (it was always threatened by enemies within the Army) but Ulsterman Major Paddy Mayne managed to keep it alive. O’Dowd’s courage and toughness typified the spirit of the SAS and he became a key member of this elite band along with legends such as Mayne, Jock Lewes and ‘Gentleman’ Jim Almonds. The SAS spearheaded the invasion of Sicily in July 1943 and then was ordered to the Italian mainland. Tragically, Chris O’Dowd was killed in action along with fourteen others in October 1943. This book is a fitting memorial to a courageous soldier whose example has inspired, and been emulated by, successive generations of SAS elite. 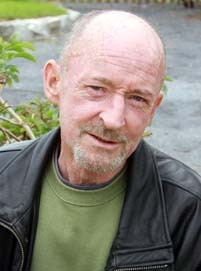 Gearoid O’Dowd has spent most of his life working as a musician in Ireland and the UK. He has also lived for a time in Sweden and Denmark. In 2001 he obtained a B.A Honours degree in Journalism from Southampton Solent University and shortly after began working on the radical magazine, Synergy. He returned to his native Galway in 2006 and began researching his uncle’s life soon after. He has a daughter, Saoirse, 26, and a son, Rossa 25.